Warm, melty cheese layered with hot jalapenos and drenched in guacamole. The bright colors of the salsa and lettuce all intertwined with the crunchy tortilla chip. There’s nothing like some nachos to brighten up someone’s day. It is the ultimate comfort food that has your mouth watering even before for the plate is placed in front of you. 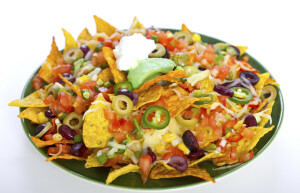 Nachos have a rich tradition with any sporting event here in the US, but what were they before? Where did they come from? Let’s take a step back from all the cheese and chips, and take a look at where this famous snack food came from.